I've been telling people a long time, that the only thing most locks do is keep honest people honest. Pretty much ends any illusion you might have about your locks being secure. 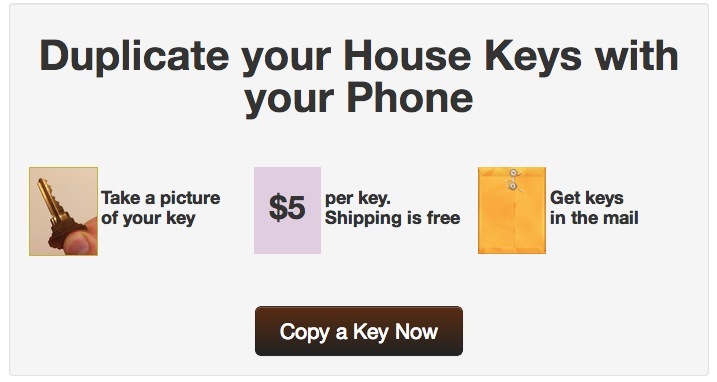 It's a service that copies your keys, from a photograph. Just take a reasonably high res pic of both side of a key, send it to them, and a few days later you get a copy of your key. ... or anyone elses key. Of course, this has always been a risk, it was just harder to clandestinely copy keys before. I'm not an idiot... and I don't believe in banning things in favor of faux security. But at this point, you have to understand, any security depending on a key, can be compromised if your key is out of your direct control in any location, for any length of time. Given the current state of things, I'm cleaning up and updating my crypto regime. I don't know how many times I've said it, but anything sent in plain text over a wireless network, or across the internet; no matter what your endpoint, last mile, or client to server security might be; is effectively publicly readable information. Never mind the NSA, half the time script kiddies can read this stuff without too much effort. It's not so much the data in flight you need to worry about (though that's not exactly invulnerable either), it's what happens to that data once it actually hits a server. It's the data at rest, wherever and however it may be at rest, for however long it may be. How secure is that server? Is that data stored in plain text? Is it in databases and spools and caches in the clear? Is the data sent from server to server in the clear? Are the backups of all those systems secure? And for that matter, how secure is your OWN internal network? Your machine may be clean and virus free, and uncompromised... but is your wireless router? Is every computer inside your network just as clean? Are they listening to your communications, or browsing your fileshares? If you want to protect confidential or higher information, or communicate with any degree of confidentiality; you MUST use strong encryption, preferably both in flight and at rest. Now, security geeks, cypherpunks, and other professional and enthusiastic amateur paranoids, have known and internalized these things for years; but the general public STILL doesn't really understand them even today. Part of the problem though, is that encryption is inconvenient and irritating. Even for a professional like me, there's still a number of things I'd like to use strong encryption for or with; where there either aren't any usable options, or those that are available are a major pain. It's better today than it used to be however; and at this point I'm going to take advantage of that fact to clean up and simplify. A few years ago, I was stuck using several different solutions, even just in my personal life, because there weren't well supported cross platform open source implementations and solutions, for the various things I need crypto for. As of now, that's no longer true with some minor exceptions (secure encrypted instant messaging, and encrypted voice communications for example). I'm now standardizing on GnuPG (or any open source OpenPGP implementation, as they should all be interoperable) and TrueCrypt; because they work well, are well supported, and do what I need them to do, on the platforms I need them. I've mostly used those two solutions for a while, but had a few others lying around. As of now, I'm 100% on GnuPG and TrueCrypt unless they are unsupported in the application I need encryption for. Yes, I know, open source purists don't like TrueCrypt because of its licensing terms (it's source available, but not fully redistributable), but as of right now, it's the best cross platform solution I've found for what it does. I'm also moving my defaults to 4096 bit keys, AES256 and SHA512 (well... they have been for a while now, but I still had some other stuff lying around). There are more secure algorithms, particularly more secure hashing algorithms out there, but these are the most secure that are widely supported by multiple platforms and devices. At this point, 1024 bit keys are factorable, within a few hours to a few days, using COTS equipment and software. Simply speaking, 1024 bit keys are no longer secure; and have been deprecated or outright revoked and banned, by most reputable authorities. In theory 2048 bit keys are not factorable within a "reasonable computational horizon", but we thought the same thing about 1024 bit keys up until the early 2000s. The current "official" government estimate, is that, if computing power increases at approximately the same rate it has averaged over the past ten years, 2048 bit keys will be viable til 2030. ... but until 2003, we thought 1024 bit keys would be viable til at least 2050; and until 2010, we thought they'd be good 'til 2020. The disadvantage to going to a longer key of course is computational. Longer keys mean more resource use in encipher/decipher... but these days, our devices have CPU to spare. Most software and devices support 4096 bit keys now, so I decided just to skip 2048 and go to 4096. If I find I have to work with a device/platform/software that only supports 2048, I'll generate a subkey. Some would ask "why are you exposing your solutions publicly, doesn't that make compromising you easier?" Well, it could... but I don't believe in security through obscurity. Any encryption solution is going to have weaknesses, and it is relatively trivial to figure out what tools you are using to encrypt. If you're going to be using crypto with the outside world, you HAVE to expose this (generally speaking)... So really there's little point in trying to hide it. Conversely, listing my solutions, will make it easier for others to use crypto with me. As of July 1st, I've issued revocations for the keychains I still have the keypairs for. There are a number of keypairs out there that I don't have the private key of anymore for various reasons.